CMAG treated some of us to a splendid dinner with excellent wines, at the Hix Restaurant at Brown’s Hotel. 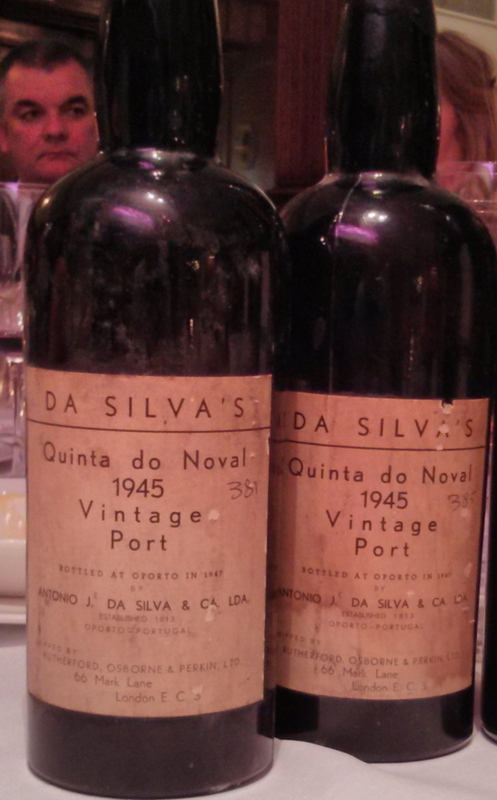 We drank their last two bottles of Quinta do Noval 1945. Also see the TN for the other N45. N45, from the ‘A’-shaped decanter which lived at the same end of the table as me. A small control sample was done at the start of the meal, before the other splendid wines. Much the paler of the two: red-brown, 25% opaque. Nose faint, and acidity showing. There was heat in the palate, and the fruits were quite faded. Later it showed better. The mouthfeel had richened and thickened, though still showing heat, and with huge length. Later later, it softened again, showing a little frailty. During its window of optimal glass time, this was lovely port, but it would have been better drunk a decade or two ago. For me, the junior bottle. Burnt orange in colour. Dusty cherries and a great nose, full of burnt toast. Wonderful impact on the palate, a huge presence with hints of marmite over a concentrated orange syrup - balancing fruit with acidity in a thick textured body. Terrific aftertaste and a huge finish with monumental length. A fabulous port, full of ideal acidity and soft tannins. Interestingly, with an additional hour in the glass, this lightened while the port from the other bottle improved and gained better intensity. 95/100 when at its best around 5 hours after decanting.